Some answered questions about our Rate & Recoil Reducing Buffer. Recently we've received quite a few questions about our Rate and Recoil Reducing Buffer. We have answered 2 of the most common below and hope that this helps explain why we truly believe that the MGI Buffer is without a doubt the best in the world. Q: What is the approximate number of rounds per minute with both rifle and carbine models? A: Our Rate & Recoil Reducing Buffer is self adjusting. In general this means that the more you need it the more it does. As an example of this, in recent test with two of our demo guns, we received the following results. The 11 1/2 inch barreled carbine was initially firing 1016 rounds per minute (rpm). After installing the MGI Buffer, the rate of fire dropped 271 rpm to a rate of 745 rpm. Our 20 inch barreled demo gun was initially shooting at a rate of 771 rpm. After installing the MGI Buffer the rate of fire fell 133 rpm to a rate of 638 rpm. Q: There should be a caliber rating for these buffers? 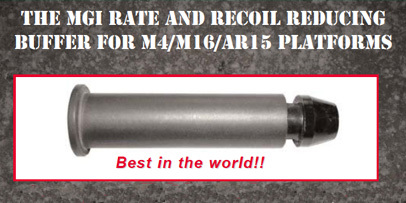 A: The MGI Rate & Recoil Reducing Buffer, was designed to work not only in the standard M4 / M16 / AR-15 platforms, but also with MGI's Modular Weapon System (Hydra). Because of the basic mechanical function of the buffer, it works very well with all of the calibers you mentioned. Basically, the harder you push it, the harder it pushes back to counter the recoil. It's function is similar in nature to that of placing a hammer in each of your hands and swinging them towards each other meeting in front of you. When they meet, they will cancel out the energy in each other coming to a stop. If you swing both hammers harder, they will cancel out each other's forward momentum. This is the same as the carrier moving to the rear as the buffer weights are moving forward to help cancel out the rearward energy of the carrier. Changing to a larger caliber just causes the weights to be hitting the carrier that much harder.